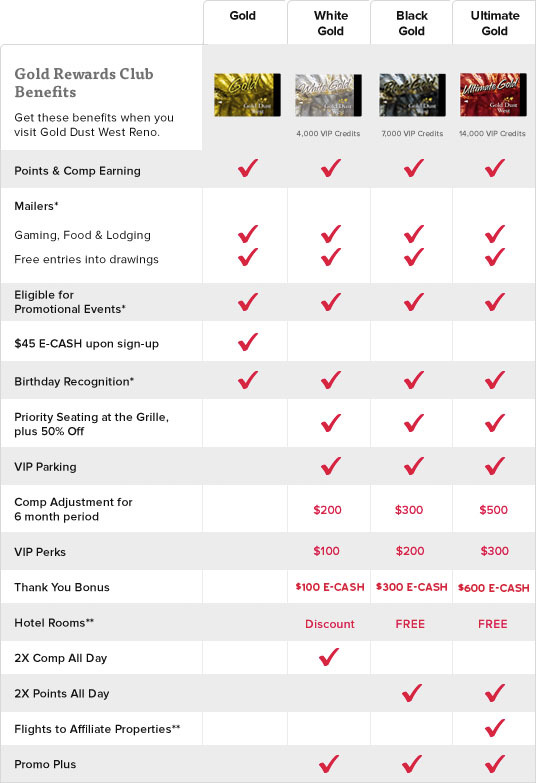 Gold Dust West’s Gold Rewards Club offers four levels, each with it’s own benefits. The higher your tier level, the more you’ll receive. Be sure to use your card every time you play and you could achieve our V.I.P. status. Your Gold Rewards Card will expire after twelve months of inactivity. Sharing your card with others will result in revoking your membership from the Club. **Rooms offered in Carson City hotel, subject to availability. Certain restrictions apply. Already a member? Your Win/Loss Statement is available immediately to you. Use the link below to login to your account and to print your statement. To earn benefits, simply insert your Gold Rewards Card into any slot machine card reader. The more you play, the more you’ll earn! You could achieve VIP status, and join one of our top three Gold Rewards tiers: White Gold, Black Gold or Ultimate Gold! Everytime you play with your Gold Rewards Card inserted into a slot machine, you’ll earn points for your play. Reel players earn 1 point for every $1 coin in. Video Poker players earn 1 point for every $2 coin in. Redeeming your rewards is easy and convenient. Points are redeemable for promotional merchandise or E-CASH right at the machine. Just hit 7 on the pin pad, input your pin number and follow the instructions. You can redeem 1,500 points for $5 in E-CASH. Promotional E-CASH is also available through the mail based on your play. Download the E-CASH right to your favorite machine but remember, all promotional E-CASH expires Friday at midnight after you insert your card into the reader. Everytime you play with your Gold Rewards Card inserted into a slot machine, you’ll earn comps. Just present your card at the Grille and “Swipe & Dine” after enjoying your meal.